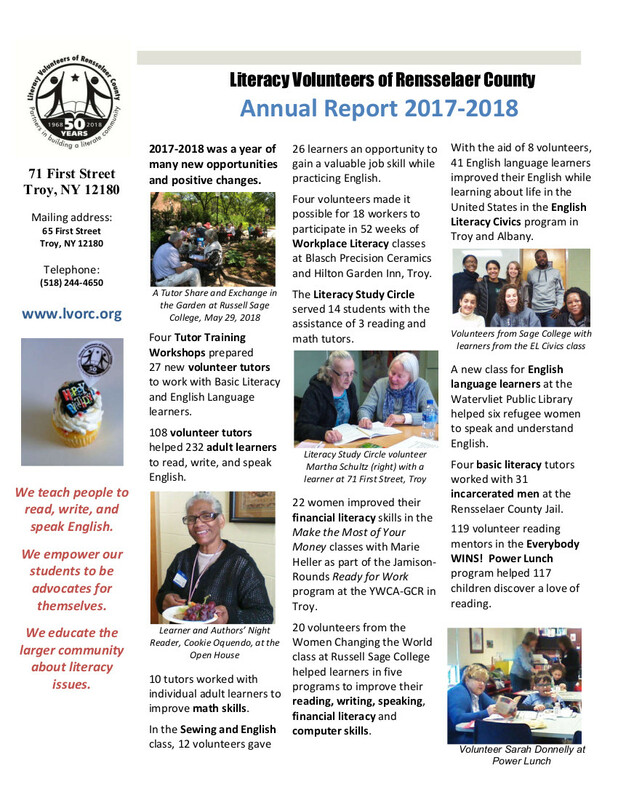 Literacy Volunteers of Rensselaer County provides free, confidential tutoring to adults and out-of-school teens in reading, writing, and conversational English; and recruits and trains volunteers to provide this tutoring. There is no cost and anyone in our area who qualifies and needs help can receive it. Sometimes, however, a person may need more help than we can give, and we will refer them to another program. A person is accepted into our program after a confidential interview and placement test. The student is told at this time if they qualify for our program. Hi my name is Shardaha. I’m 19 and I have a 3 year old daughter. I had to leave school at age 15 to raise my daughter. I felt like my teachers didn’t care if I finished my education. I left school when I was only in the ninth grade. So, I’ve been struggling to be a good mother. But it’s frustrating and hard not to be able to answer my babys questions or read her a book. There were lots of things I couldn’t do because I could not read and write. I was down and ready to give up. Then I met my tutor from Literacy Volunteers. The first thing that I thought was it’s not going to work. I had no confidence, I didn’t believe in myself and I thought it would be too hard. My tutor Linda gave me ideas to make my life better. She understands me when I’m trying to explain something to her. I did a lot of things that I thought I couldn’t do. I even met most of my goals. We meet at the library twice a week. Finally I’m learning to read and write. I’m working to get my G.E.D. Now with Linda’s help I believe I can do it! Practice makes perfect! It’s all worth it. I tried going back to school many times but I felt that I was not learning the way I should. I heard about the Literacy Volunteers of Albany. I was paired up with a nice lady named Wendy. She worked with me for many years. We met at the library once a week and we read books. This made me feel good about myself as I was getting the help I needed from her. I felt that the Literacy program was a blessing from God. Then I moved from Albany to Troy. I was going to EOC and once again I felt like I needed help. I asked the people in the office did they know about a literacy program over in Troy and they said yes, right up the street. They gave me the number and I called and I was told to come in for a test. I went in to take the test and met Marie. She was very nice and she made me feel good about coming there and she started me on my way to the next step. Then I met Kathy. We meet once a week at the library and we read and do worksheets. She helps me with more than just reading; we bond, she listens to me, she cares about me and the job she is doing. We have good communication and have a good time learning together. She helps me build up my self esteem and confidence. I think I could do anything that I set out to do. I thank God for the program, the tutors and the people that care.